As your local Milgard Certified Dealer, Master Craftsmen Inc. is proud to help you create the home you and your family deserve. As a family owned company serving the Las Vegas community since 2004, we are dedicated to providing quality products and customer service. We believe it's not only important to find the right product for your home but the right people behind the product. A visit to our 5,000 sq ft showroom, centrally located in the heart of Las Vegas, will allow you to leisurely browse and operate a full line of windows and doors to fit every style and budget. Our helpful and knowledgeable staff is here to answer your questions and assist you from start to finish in a hassle free environment. With Master Craftsmen Inc., we will help you "Create a Better View." Master Craftsmen,Inc. is rated 4.9 out of 5 by 18. Rated 5 out of 5 by BonJean from Excellent service and professionalism! 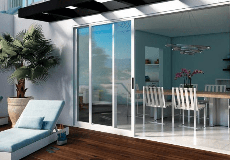 We love this sliding door. The whole process was very smooth from start to finish. Master Craftsmen was knowledgeable and skilled throughout the whole project. We are very happy with the product and the installation. It has enhanced our home tremendously. We are extremely satisfied with our new door. Rated 4 out of 5 by RedSq from All good! We got a few windows replaced by MC and everything went fairly well. I've done quite a bit of research before going with them so I can definitely say that the price is right. They may not be the cheapest windows but they are definitely not overpriced like some other reviewers stated. I did get one of the quotes for few hundred dollars less but the windows were worse specs and not from major manufacturer so I decided to go with Milgard from MC. There was no sales pressure from MC person....just straight talk about the options (now talk about Renewal by Anderson sales people). Delivery took about 6 weeks from the date we signed the quote. I don't have a problem with timing since it was just an upgrade and we were not in a rush. I had to call the office couple times and I admit there was a lack of communication as for how long more we have to wait but they did call me back next day. Install went very well. Guys showed up as promised and did great job with install and cleanup. We could immediately tell the difference between old windows and the new. I'm getting another quote from them to replace the rest of the house. Great job, MC. Rated 5 out of 5 by Warmer and Quieter from Choose Master Craftsmen for replacement windows I chose Master Craftsmen to replace the windows in my home. (Milgard was a no brainer, since I had used their windows in Washington.) I could not be happier with my choice of company, from the president Mike coming to do the estimate, to the foreman Emidio finalizing measurements, to Christina who answered my questions at the showroom, to Nico, Jose, and Heron who did the installation. Customer service was excellent, and it especially showed when something went wrong. One day when I returned from work, I was informed of an accident that bent some verticals in my pergola. I was told the office had been notified. I phoned in to ask what would be done. Within a few minutes, Matt the operations manager called back to say everything would be taken care of. Within an hour of my phone call, Emidio was at the house to inspect the damage, and all bent verticals were replaced. Everyone at Master Craftsmen was polite, considerate, and professional. If you want replacement windows or door, make sure to contact them. Rated 5 out of 5 by YvonneMD from Great service We had a door and a few windows put in at our house. The installation process was smooth and seamless. The guys were professional, quick and everything was installed perfectly and with minimal mess. I would highly recommend Mastercraftsmen as a result. Rated 5 out of 5 by Corn from Love my Windows! Love our windows and the install crew was very professional as was the estimate guy.